I'm about to tell you about the most beautiful place to stay on Earth. I'm slightly hesitant to give this secret away because it's so good. We've all seen what happens when a place starts to go viral and then gets overrun, overshot, overhyped and overdone. Santorini and Cinque Terre being two examples, these gorgeous places end up being a victims of their own beauty. Here's the thing about this place though: only come if you will do your part to keep it the same. 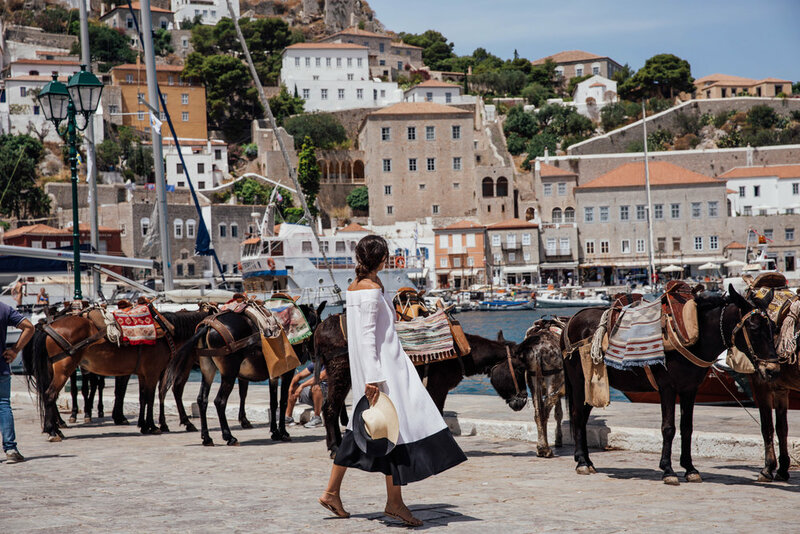 Hydra, Greece, is one of those places on Earth that has cherrypicked the good of modernization (plumbing, electricity) but has shunned the bad (motorized vehicles of any kind, egregious architecture, hyper-tourism). Because of these decisions to honor the colorful history of the port and island, Hydra has become the most peaceful place on Earth. It stands for exactly what we all truly crave deep down inside: disconnection from noise and connection to simplicity. Everything is simple on Hydra. Need to get around? There's a donkey for that. But not like an overworked Santorini donkey parading tourists around but real working donkeys who still run provisions up a hill to the monastery or deliver wood beams to a builder. They just so happen to moonlight as suitcase butlers. This one choice of transportation option, besides your own feet, makes the island resonate with sounds of everyday living. Ropes clink against fishing boats in the harbor, donkey hooves clunk against the cobblestones and a bell rings every morning to tell the shopkeepers that the provision boat has come into port. If you want directions you better be ready to listen. Turn right at the clock tower, pass the fruit stand, go straight past the apotheke, up the hill past the donkey stables and you'll get there. Easy right? Everything has a true, simple purpose. Kris and I were lucky to chose Hydra as our wedding destination. This time around we decided to find one of the island's unique captain homes to hang our straw hat for a few weeks. The owner, Christos, met us at the ferry in Piraeus and rode the whole way on the water taxi delighting us with Hydra stories and notes about the home. Nopi, the bright and lovely housekeeper, would be there to clean and provide anything we needed. She would bring us giant blocks of fresh feta and she even wrapped our wedding table garlands around the bougainvillea tree. We instantly felt at home. Maybe a little too much at home ;-). Christos will forever have us begging for the house every year! It's by far one of the most magical homes I've ever experienced. It would be hard to go back to Hydra and stay at one of the few boutique hotels. This house is an experience for lovers, for families and for friends. Thanks to Christos for making our wedding weeks so special. This isn't sponsored in any way (not that it would change my approach to writing about it) but I truly feel that you would have the experience of a lifetime if you decide to go off the beaten path and give this a try. Grab some friends and family and split the cost of the house. It's magic! You can view the property by clicking on the button below or reach out to me on social or through my contact sheet and I can give you Christos' email directly!